Coverage: New lawns, 3 lbs, per 1,000 square feet. Overseeding: 1.5 lbs. per 1,000 square feet. Ideal for full sun or partially shady areas. Especially good for late season seeding. Best blend for heavy traffic from children and pets. Contains Secretariat II GLSR Perennial Ryegrass, Exacta II GLSR Perennial Ryegrass and charismatic II GLSR Perennial Ryegrass. Triple Play Rye Turf mix of premium grass seed. Specially formulated improved turf grass varieties of Rye grass. Extremely durable and establishes quickly for erosion control of Bermuda grass, - (Double Time Perennial Rye, Palmer III Perennial Rye and Panther GLS Perennial Rye). One of the easiest types of grass to establish with fast germination; produces a fine-textured lawn that maintains its color into winter; cool-season perennial grass; produces a premium, lush green turf; good traffic tolerance, insect and disease resistance; requires less watering and mowing than common Perennial and Annual Ryegrass varieties; contains Pennington's exclusive "MYCO Advantage" technology and Pennington's exclusive "Penkote" technology. 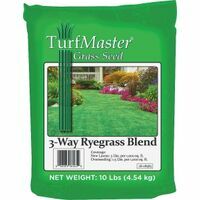 Best for a temporary seasonal lawn, also ideal for reseeding warm-season grasses. Specially formulated improved turf grass varieties of Rye grass. Extremely durable and establishes quickly for erosion control. Quickly grows a thick and green lawn almost anywhere. Drought resistance; heavy traffic tolerant. Grows in poor soil. Insect resistance; neglect resistance. Endophyte enhanced.